What is a chuck box? A chuck box is a dedicated box that carries your camping kitchen gear in an organized fashion. Having your gear organized has several advantages. First if you have a dedicated Camping Kitchen Box (Chuck Box or Grub Box, or Patrol Box (as the Boy Scouts call it) ) loaded up with your camp kitchen gear, your packing for your next adventure is already half done. A proper chuck box is not just a box though. It should have dedicated shelves and drawers that keep your camp kitchen gear organized and easy to access. What makes the Camping Kitchen Box different then a typical chuck box? The first standout feature is its weight. Traditional chuck boxes are made from plywood. depending on the construction method used, and the thickness of the plywood, these boxes can way anywhere from 30 to 60 or more lbs. empty. The unladen Camping Kitchen Box weights 12 pounds (less then 1 stone). That extra weight makes a big difference. 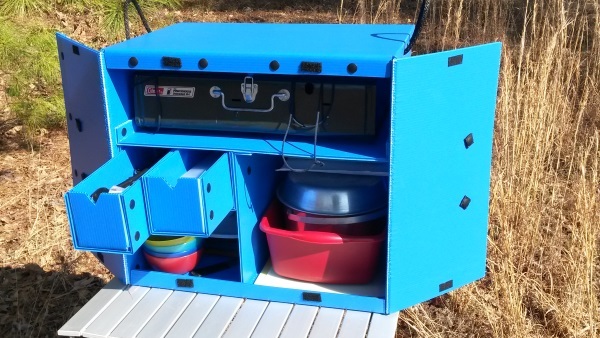 Another outstanding feature of the Camping Kitchen Box is it's layout. It was designed to accommodate certain critical pieces of equipment. The first piece of equipment is your stove. The CKB stove compartment will easily swallow most standard 2 burner propane or white gas stoves, with room to spare for a griddle. The second piece of equipment that some chuck boxes ignore, because it is just not glamorous is the the wash tub. The CKB will easy fit a standard 12 quart dishpan (or three) , so you can properly keep clean up after your meals. Finally the Camping Kitchen Box features 2 Large drawers so you can really organize your cooking utensils and other small items that would normally get lost at the bottom of a large tub or cardboard box.